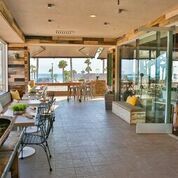 At the corner of PCH and Main St in Downtown Huntington Beach, we are on the second floor overlooking the Pacific. 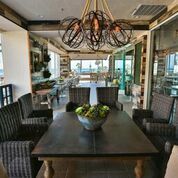 BLK Earth Sea Spirits is located in beautiful Huntington Beach, California. 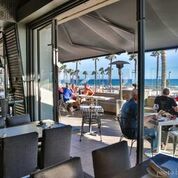 Featuring the finest ocean view dining of the beach area and specializes in Kobe Style Beef hand-cut steaks, chops, seafood. 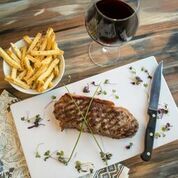 The distinctive menu comprised of contemporary American cuisine is prepared on either a Hickory woodfire grill or in a 1600 degree specialty Steak broiler creating delicious and savory flavors in all the meat, poultry and seafood dishes. 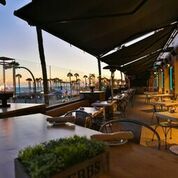 In addition to a la carte dining, the restaurant offers a heated terrace overlooking the ocean that is wonderful for special events, romantic occasions and private functions for up to 200 guests. We are available to handle the planning of your special events and to make your dining experience comfortable and delicious. Welcome to BLK Earth Sea Spirits. The best view in Huntington. Enjoy a cocktail and the ocean breeze. Inside or out, there is not a bad seat in the house. Start off with one of our many appetizers. 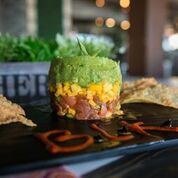 Pictured is our fresh Ahi Tuna Tower. We proudly feature Akaushi Kobe Style Prime Cut Steaks. 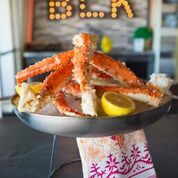 We offer a variety of freshly caught seafood. 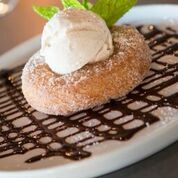 Wrap up your dining experience with a BLK Cronut.